I can't believe Easter is almost here- this year is seriously flying by! One of my favorite things to do every spring is fill an Easter basket for Bear with a few things to wear, play with, and read. I'm so excited to be doing a little basket for Boone this year, too! Here are some of my favorite picks for their baskets (and a few for little girls, too!). 1. The Tale of Peter Rabbit Story Board Book- Only $6 with free Amazon Prime shipping and the sweetest Easter book! I always try to include at least one book in Bear's Easter basket that is festive for the occasion, and then we have fun pulling the books out each season to read. I display them on a bookshelf in his room so they double as educational and cute seasonal decor. 2. Photo Frame with Rabbit Ears- So sweet and perfect for your little bunny's room with a picture of them in their Easter best! Also comes in white. 3. Zippy Flyer Where's Baby Bunny Game- A fun, interactive hide-and-seek game between adults and children helps them develop and explore new skill sets as they grow. 4. Salt Water Sandals- Can't say enough good things about these sandals that we've been buying (well, my Mom has been buying) for Bear every year since he was just one year old. He's had red, the traditional tan, and navy and they are seriously the best things we've ever purchased for him. The leather molds to fit the childs' feet and they are waterproof so they're great for the pool, beach, splashpad, etc. Yet they're dressy enough to wear to church! I could ramble on all day because we love these shoes (and they're gender neutral..so cute for girls, too). 5. Bunny Growth Chart- I fell in love with this sweet wall decoration the second I saw it, especially just just $17.99. I like the ruler growth charts that have been so popular the past few years but this one is unique and so cute for a nursery or playroom! 6. Snuggle Blanket- Boone is getting this because it is so cozy and soft (and I'm a sucker for bow ties). 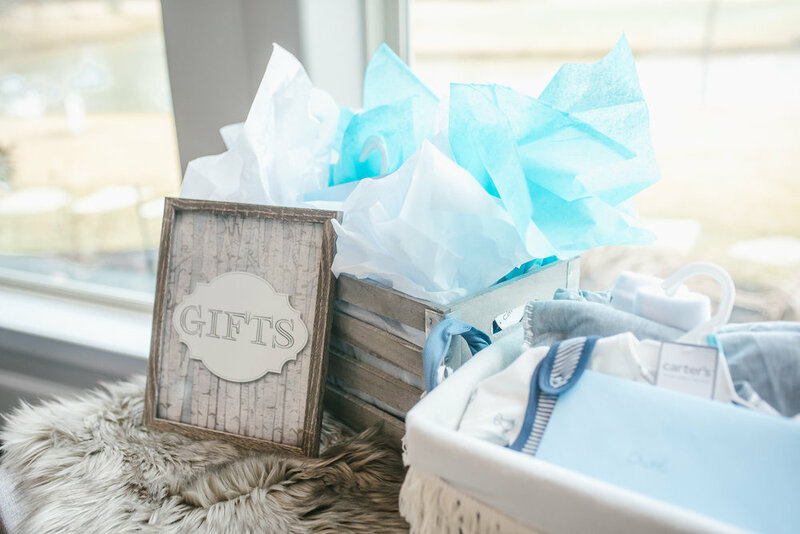 Only $7.99 and would be perfect to include in a baby shower gift, too. 7. Monogram Easter Basket Liner- I kind of couldn't believe it when I saw this personalized basket liner for just $4! Compared to more expensive versions I've seen in some stores, this one is a steal and great quality for the price. Liners are reversible and also come in blue/green. 8. 11-Piece Easter Tic-Tac-Toe Game- A classic wooden set that will last for generations to come; I had to get one of these to set out on our coffee-table because it's just as cute used as decor as it is to play with! 9. Baby Aspen Bunnie Hooded Robe & Stuffed Animal- Dying to get my boys into these robes...they only have hooded towels but I can't get over how precious these are! A little bit of a splurge but the quality should be worth it, especially if you can pass down to a younger sibling. 10. If I Were a Bunny Board Book- The most adorable board book for your little bunny! Off to hold my baby boy who thinks he needs to be eating every 30 minutes, much like his big brother was. I secretly love all the cuddles though- his basket will be full of all things "bunny" because he's our little snuggles bunny! 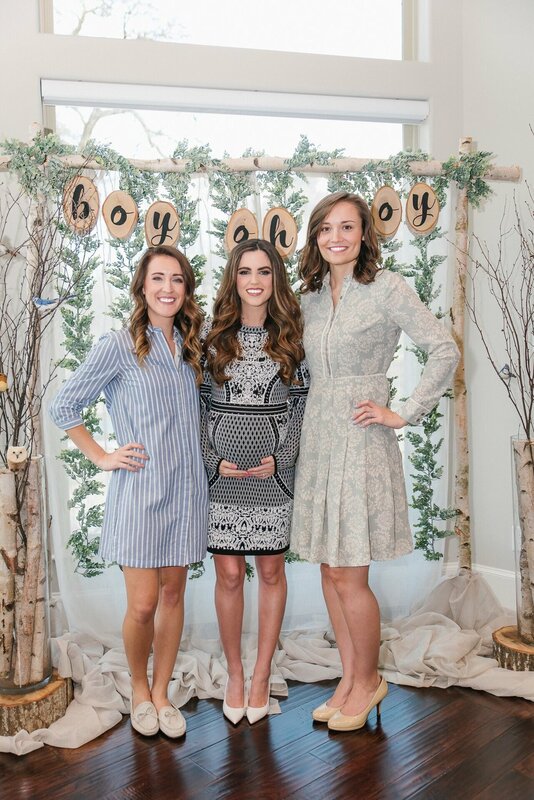 I'm not even sure how to begin this post because I am still absolutely blown away by the baby shower my friends gave us last Sunday- it was so incredibly beautiful, special, and all such a labor of love. As soon as I told my best friend, Elissa, months ago that we were expecting, she informed me that she would be planning a baby shower. Never in my wildest dreams did I think it would be anything like this but I should have known considering E's creative eye and the fact that she puts her heart and soul into everything she does. Her wedding 3 years ago was something out of a magazine; Elissa and her Mom, Jody, both need to be in the party planning/wedding business. They are so talented! See some from E & Jose's wedding here. 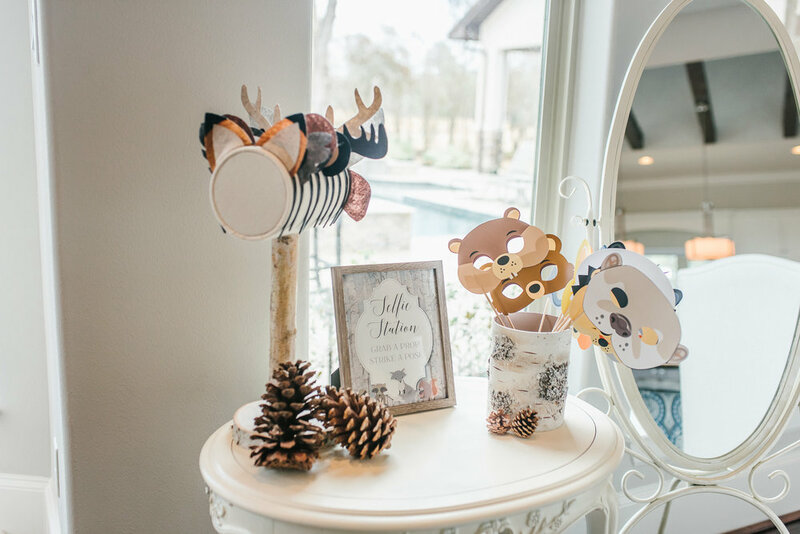 My friend Shelbi and her Mom sweetly offered to host the baby shower in their home (which is absolutely stunning as you'll see below), and they all made magic happen. 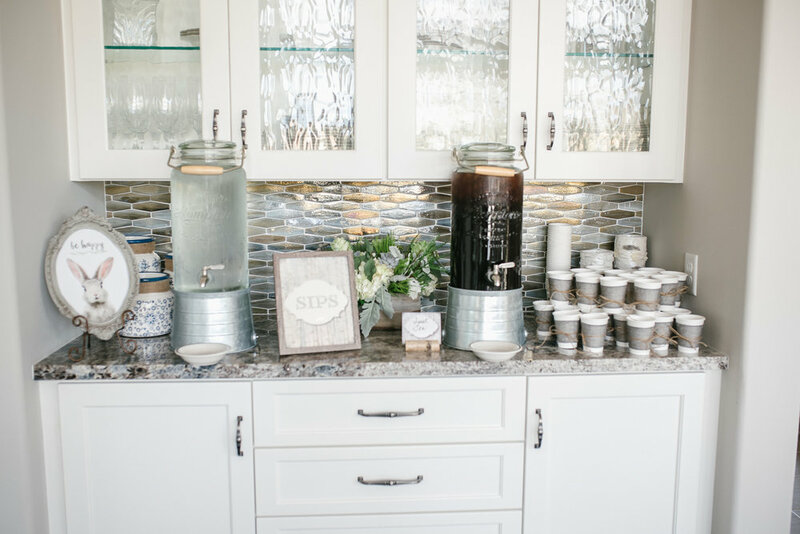 I just got to show up and get pampered and spoiled, but I know that countless hours went into making all the details and decor you'll see below. 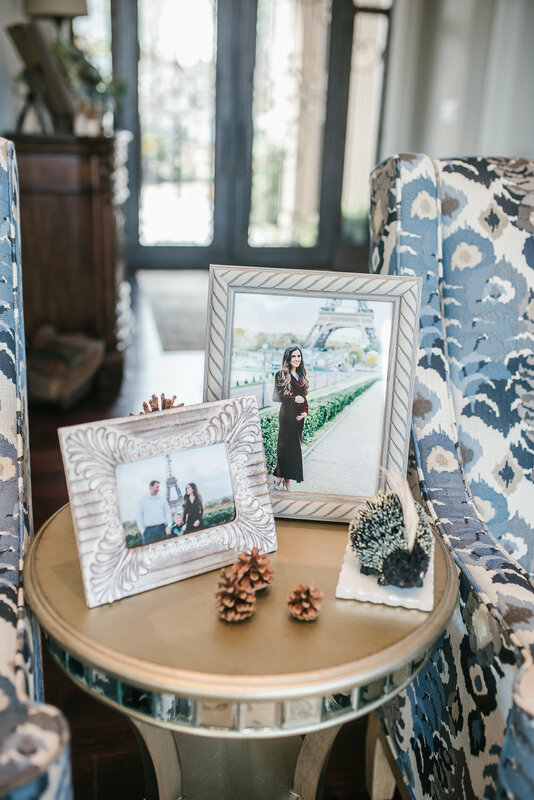 Elissa's husband, Jose, even crafted much of the decor, like the place card holders and guest book. In the weeks leading up to the shower, if I'd call E, she'd answer the phone with "Baby Shower Central!" 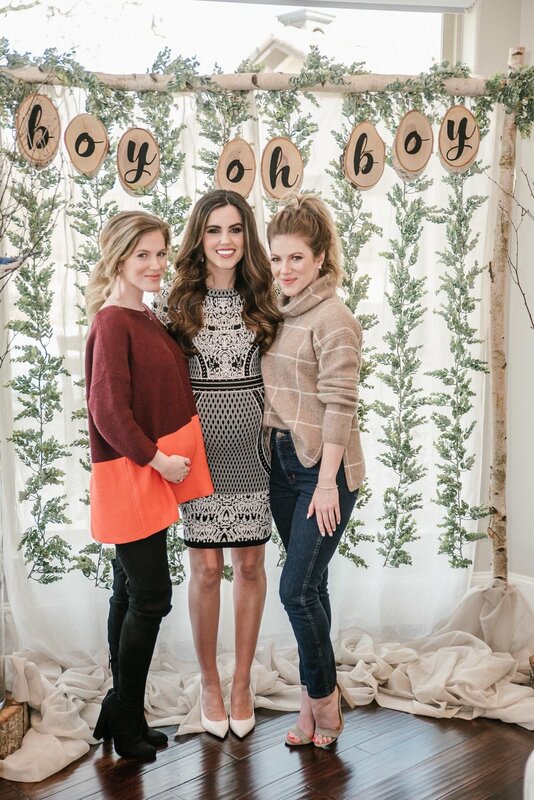 as she did so much crafting, creating, and planning for this event. Even the plates we ate off of at the shower were made out of birch wood! I'm talking every last detail=perfection. I can't thank Elissa, Jose, Jody, Shelbi, her mom, Kelli, and her sister, Lindsey, enough for making this day one I will always cherish. And of course all of my amazing friends who spent their Sunday showering us with love. 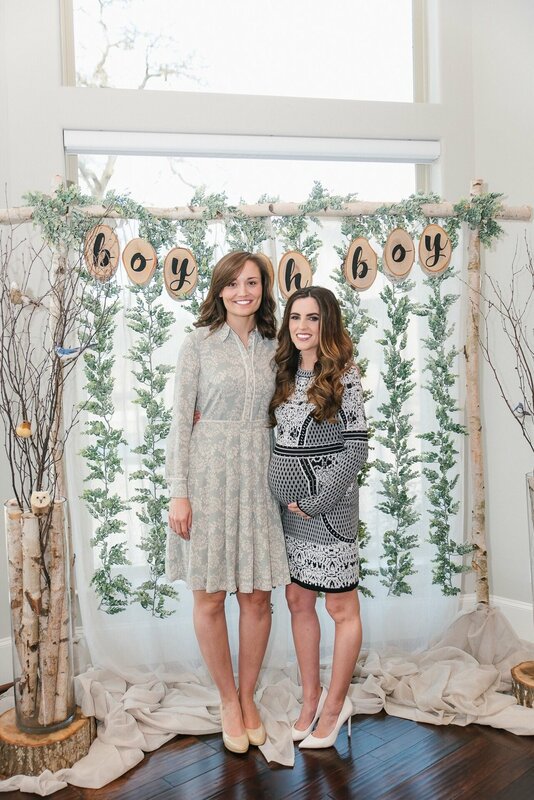 I cannot get over how kind and thoughtful you all are- Baby Boy is very lucky to have so many wonderful aunties! Big Centerpiece: Made by Lary's. They placed birch logs in a clear vase and put an arragement on top. They gave it some height by putting the vase on top of a wooden stump found at HomeGoods and decorated with animals and moss at the base. Birchwood Backdrop: Elissa ordered the frame from Annie's Creek on Etsy, and ordered birch slices from eBay for the banner. 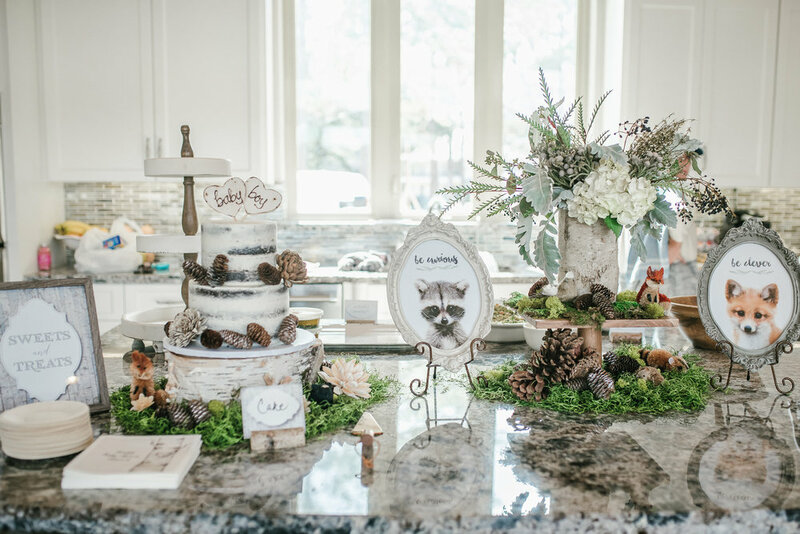 She hand painted the letters herself using graphite paper transfer and decorated the backdrop with faux greenery and sheer fabric. *If you order from Annie's Creek on Etsy, she recommends ordering solid logs but NOT assembled. The joined ends were botched and she had to cover them up with greenery. Just a side note! Other decor: Elissa ordered the bottle brush/sisal animals from Amazon. 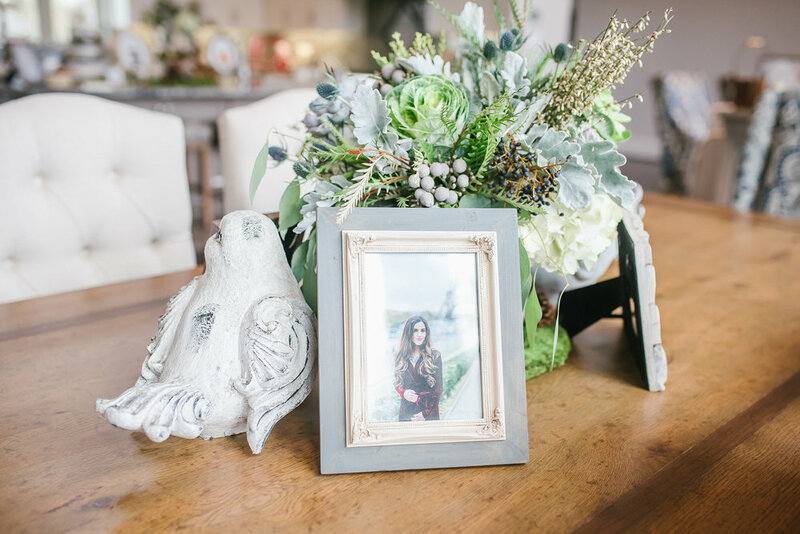 Her husband made the twine holder, guestbook frame, and headband holder. Everything else ordered from Etsy. Food: Zoe's Kitchen : Always our go-to for events, Zoe’s kitchen is a crowd favorite every time. Several guests at the shower had dietary restrictions/were vegan, and Zoe’s Kitchen accommodates everyone’s needs. Delicious and healthy…my personal favorite are the chicken kabobs! I just want to say a huge thank you, from the bottom of my heart, to everyone who made this day one I will never forget. Driving home that evening, I felt so much love and just kept thinking, "This little boy is coming into a world where there really are a lot of really good people". And 'really good' doesn't even begin to sum them up. Zach, Bear, Baby, and I are grateful beyond words and love you all very much! After Christmas, our HEB had Pillsbury Pie Crusts on major sale and Zach convinced me to buy a fridge-full of them with no clue what we'd end up using them for. After a week of pie crusts staring me in the face every time I went to grab a Diet Coke (which is often), I was on a mission to put at least some of them to good use. Then it hit me: homemade pop tarts. Or semi-homemade, anyway. We already had everything we needed to make them so I got busy. And y'all, best decision ever. 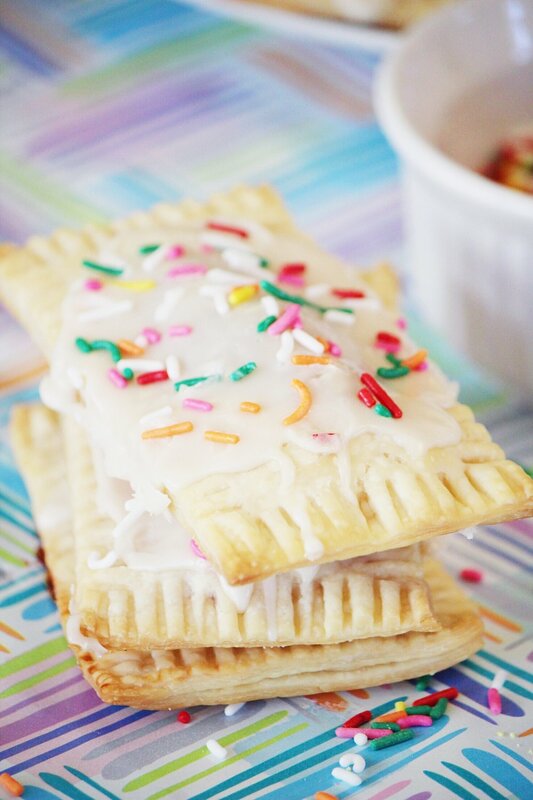 Not only are these homemade pop tarts easy to make, but they're absolutely delicious. The recipe I followed called for strawberry preserves and while I'm sure that would be tasty, I opted for cherry pie filling instead. Basically because I'm pregnant and want all the sugar and can eat that stuff straight from the jar with a spoon. 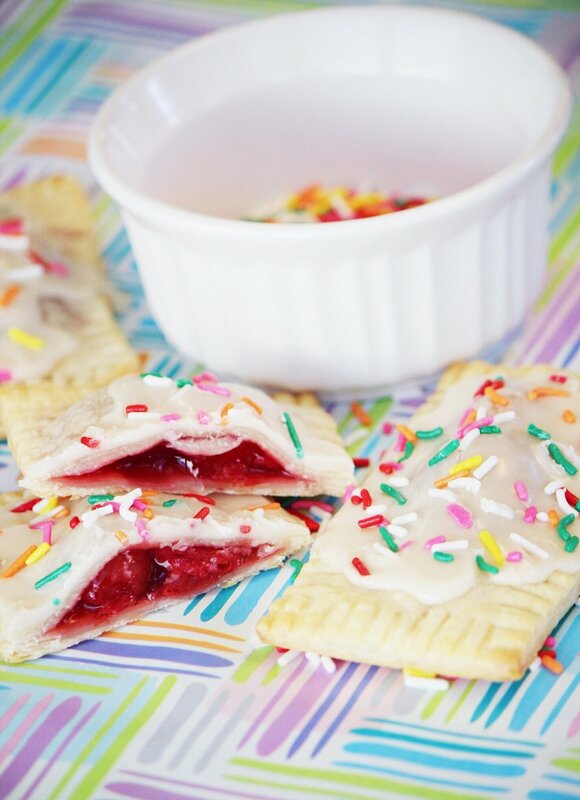 So these pop tarts are mini pies, pretty much, which is why they're so delicious. A flaky crust with a warm cherry filling, topped with rich vanilla frosting. I ate 3 within the first 30 minutes of making them...and the rest disappeared soon after. You could fill them with just about anything: fresh strawberries, Nutella, PB&J, cookie butter, jelly, etc. I think Nutella+strawberries+almonds (my crepe of choice) will be my next pop tart feat. You could whip up these tasty treats on a Saturday morning for breakfast, or make them festive with heart sprinkles for a Valentine's Day party. 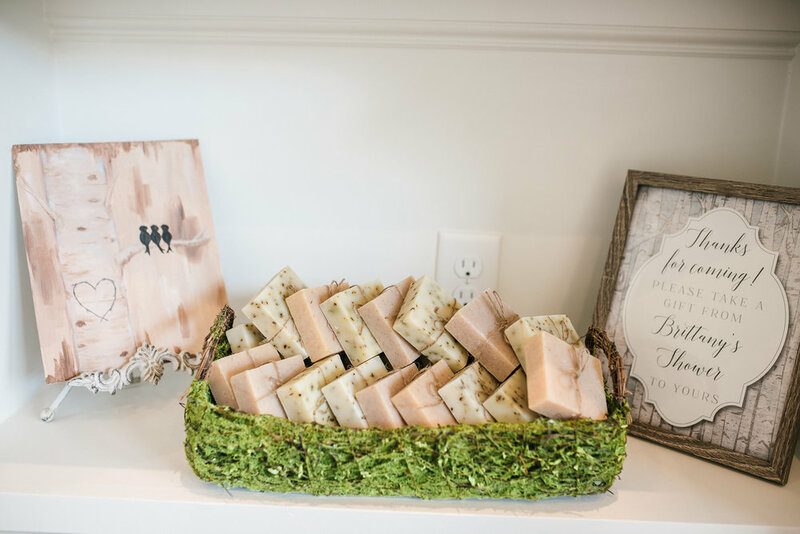 The possibilities are endless and no matter what the occasion, they're sure to be a hit. My boys loved them and they're pretty tough critics; we'll definitely be making them again soon. 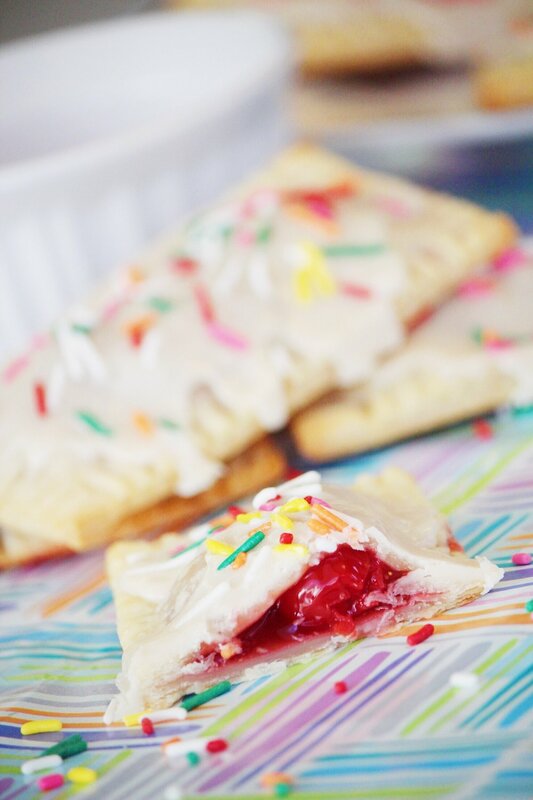 There's something about the buttery crust, sweet cherry center, and sugary frosting that makes these homemade pop tarts irresitable to all. The frosting is arguably the best part- it's so sweet and delicious...Bear and I were eating the extra with a spoon. You might have to add additional milk or powdered sugar until you reach the right consistency but once you do, you'll know. And you should definitely taste-test because you'll want to lick the bowl. 1. Preheat oven to 425 degrees F. Line baking sheets with parchment paper or foil. 2. Unroll the pie crusts, place on a lightly floured work surface, and roll the crusts slightly with a rolling pin to square the edges. Cut each crust into 8 equal-sized rectangles. Place about 2 teaspoons of cherry pie filling in the center of 8 squares, and spread the filling out to within 1/4 inch of the edge of the pastry square (a little goes a long way). Top each with another pastry square, and use a fork to crimp the squares together, sealing in the filling. Use a knife to trim the pastries, if desired. Move the filled pastries to the prepared baking sheets. 3. Bake in the preheated oven until the edges are lightly golden brown, about 7 minutes. Allow to cool on the baking sheets. Meanwhile, stir together the confectioners' sugar, milk, and vanilla extract in a bowl to make a spreadable frosting. 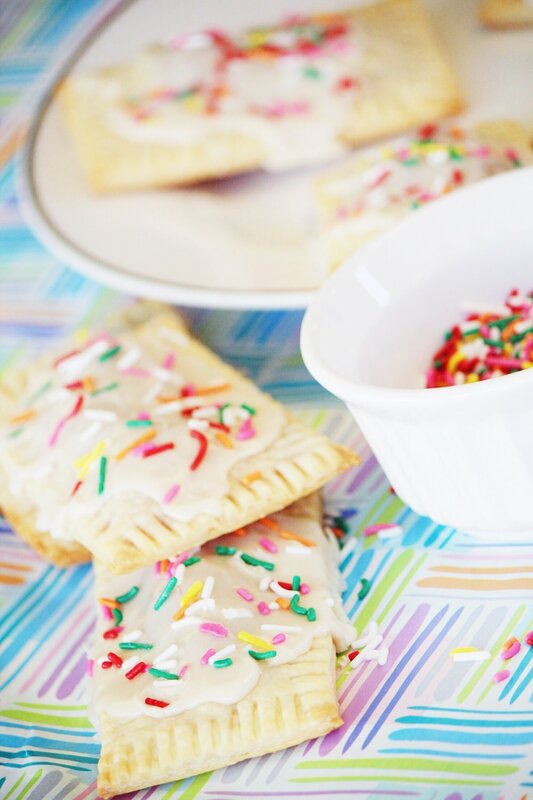 Spread the cooled tarts with frosting and top with sprinkles. Let frosting cool and harden, then enjoy! Bear and I are headed out for a few Friday errands before the fun weekend ahead. We're trying to get lots done yet find time to relax before the baby comes next month, which is a hard balance but no matter what I just want to enjoy this time with Bear. So Chick Fil A and Toys R Us stops will likely be happening today, as well.